The Reverend Horton Heat: 25 to Life was filmed and recorded live at the legendary Fillmore Theater in San Francisco in 2010 and includes live concert footage, band interviews, crew interviews and more. This movie captures the sights, sounds and energy of The Reverend Horton Heat doing what they do best - performing live and killing it. In addition, the interviews, historical images and footage, provide background and a deeper appreciation for one of the hardest touring bands in the business. They've been at it for over 25 years and they show no signs of slowing down. 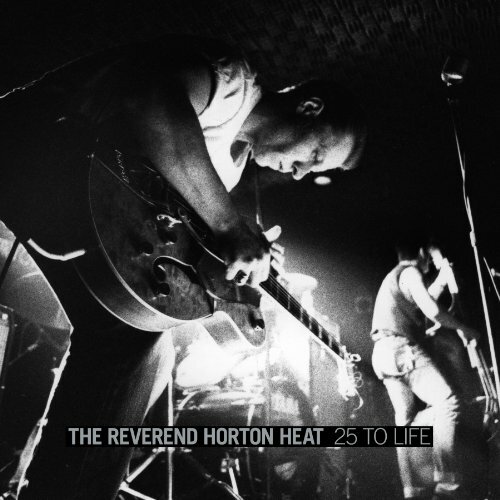 This deluxe boxed set of The Reverend Horton Heat: 25 to Life includes the full film on DVD plus 2 CDs featuring a live album of the recordings made at the Fillmore plus the first ever, career spanning ''best of'' compilation of the band's studio recordings. See the full track listing for all three discs below. Along with the DVD and 2 CDs, the set also includes a 52 page booklet featuring images and stories from the band's 25 year span. The entire set is housed in a collectable box.